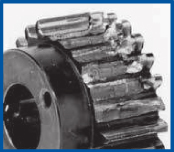 KHK stock helical gears are quiet, compact and economical. They are suitable wherever you require high-speed rotation including in machine tools, speed reducers and other industrial machinery. The following table lists the main features. Features : Have excellent strength and wear resistance which allow your designs to be more compact. Finished products for J Series are also available. Features : Having larger contact ratios compared to the SS spur gears, effective in reducing noise and vibration. 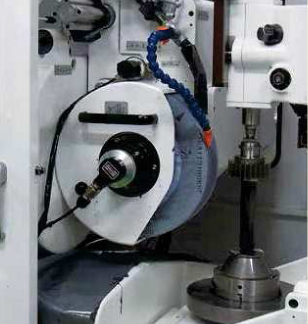 The use of electro deposition grinding wheel produces consistent precision with shorter grinding usage, making products affordable. It is important to thoroughly understand the contents of the product tables as well as “CAUTION” notes before making the selection. You must specify the right or left hand by including the letter R or L in the catalog number when ordering. 1. Caution in Selecting the Mating Gears. gears are not interchangeable. Please keep this in mind when making your selection. 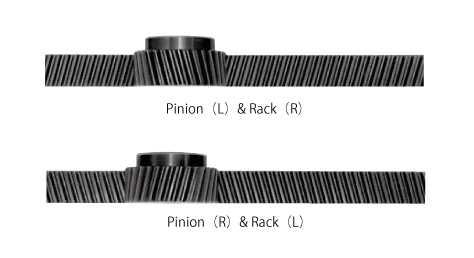 Also, right hand and left hand helical mating gears are packaged as a set. See the photos below for reference and for help in making a proper selection. The table shows the possible combinations. 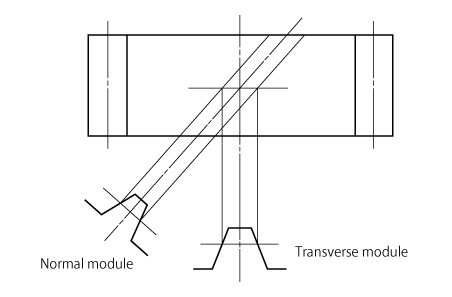 The difference between transverse module and normal module is defined as the difference of basic tooth form. 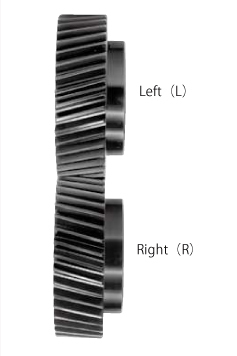 As shown on the right, the module of tooth datum orthogonal to the center axis of gear is called transverse module. The module of tooth datum orthogonal to the thread helix is called normal module. The characteristics of each are shown as below. [CAUTION] Above is for illustration purpose only and not a representation of the true tooth forms. For detailed technical information, please refer to separate technical reference book, in the section of “4.3 Helical Gears” (Page 22). Advantages : Replaces spur gears having the same module, number of teeth, and center distance. Disadvantages : Special gear cutting or grinding machines are required for processing each helix angle. Advantages : Modifications of spur gears are made by gear cutting or grinding machines, even if they have different helix angles. Disadvantages : Have a center distance value different from that of a spur gear, although they have the same module size and the same number of gear teeth. The center distance value is rarely an integral number. Allowable bending strength and surface durability values shown in product tables were computed by assuming a certain application environment. They should be used as reference only. We recommend that each user computes his own values by applying the actual usage conditions. To find more information on gear strength calculations, please refer to separate technical reference book, in the section “Bending Strength of Spur and Helical Gears” (Page 71) or “Surface Durability of Spur and Helical Gears” (Page 78). to the units needed in the equation. [NOTE 2] The allowable bending stress at the root σFlim is calculated from JGMA401-01, and set to 2/3 of the value in the consideration of the use of planetary-, idler-, or other gear systems, loaded in both directions. The allowable bending strength of a gear is defined as the allowable tangential force at the pitch circle based on the mutually allowable root stress of two meshing gears under load. Example of the failure due to insufficient bending strength. The surface durability of a gear is defined as the allowable tangential force at the pitch circle, which permits the force to be transmitted safely without incurring surface failure. Example of the defacement due to insufficient surface durability. 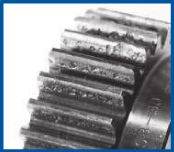 In order to use KHK stock gears safely, carefully read the Application Hints before proceeding. If there are questions or if you require clarifications, please contact our technical department or your nearest distributor. The reference datum for gear cutting is the bore. 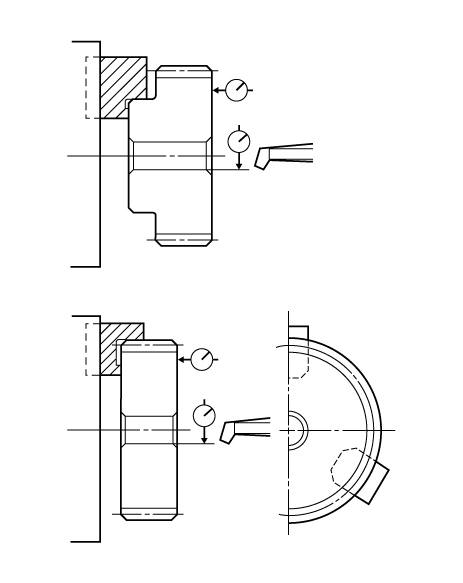 Therefore, use the bore for locating the center. 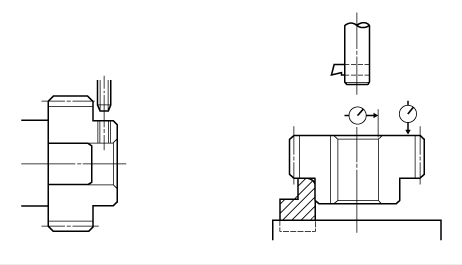 If it is too difficult to do for small bores, the alternative is to use one spot on the bore and the runout of the side surface. If the rework requires using scroll chucks, we recommend the use of new or rebored jaws for improved precision. If chucking by the teeth, please apply the pressure carefully to avoid crushing the teeth which will lead to noisy gears. The maximum bore size is dictated by the requirement that the strength of the hub is to be higher than that of the gear teeth. The maximum bore size should be 60% to 70% of the hub diameter (or tooth root diameter), and 50% to 60% for keyway applied modifications. In order to avoid stress concentrations, leave radii on the keyway corners. 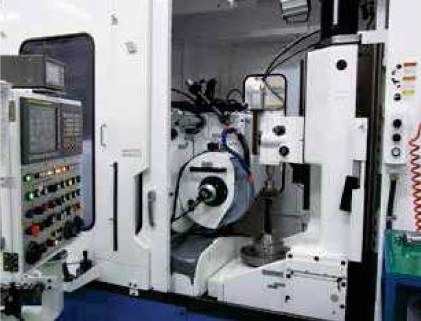 To avoid problems of reduced gear precision and other manufacturing difficulties, do not attempt to machine the gears to reduce face widths. KHG Ground Helical Gears are already stress relieved. But if you subject them to a heavy turning operation such as removing the hubs, the residual stress may cause deformation. When heat-treating SH Helical Gears, it is possible to get thermal stress cracks. It is best to subject them to penetrant inspection afterwards. If the tooth strength is not sufficient, it can be increased approximately four times by heat-treating. On the other hand, the precision of the gear will drop about one grade. Hardness : From 50 to 60 HRC. *Hardness and Depth of Gear-teeth Induction Hardening The hardening method and the state of hardened teeth area are varied depending on the size of gears. Since different hardening treatment is applied in accordance with the module and number of teeth, the hardness level you designate is referred to as the hardness of the reference diameter. For some of our products, there may be a case that the hardness at tooth tip / root may not be equal to the hardness you designated. As to the effective case depth for S45C, it is specified by JIS, as “The distance from the surface of the case to the area with hardness HV450”. The case depth differs from area to area of a tooth. 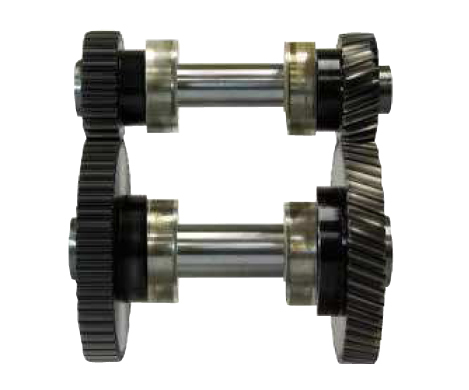 KHK stock helical gears are designed to give the proper backlash when assembled using the center distance given by the formula on the right (center distance tolerance of H7 – H8). The amount of backlash is given in the product table for each gear. Please refer to overall length tolerance for Helical Gears on page 33. 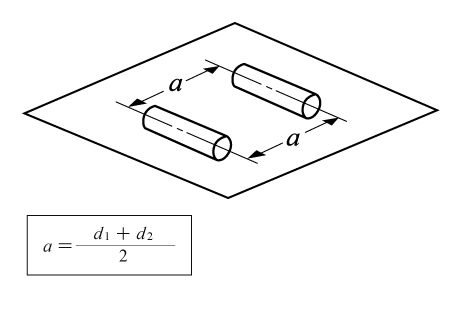 Because of the helix of the gear teeth, helical gears in mesh produce thrust forces in the axial directions. 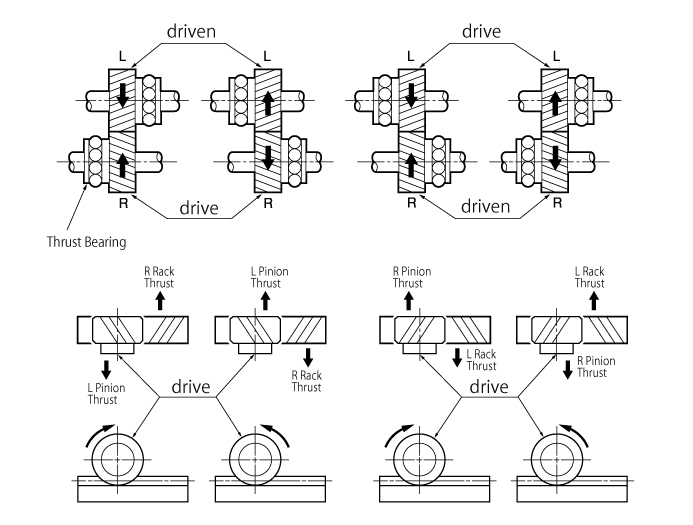 The axial thrust bearings must be able to resist these forces. The direction of the thrust forces depend on the helix hand and the direction of rotation as shown below. For details, please refer to separate technical reference book, section of “Gear Forces” (Page 107). 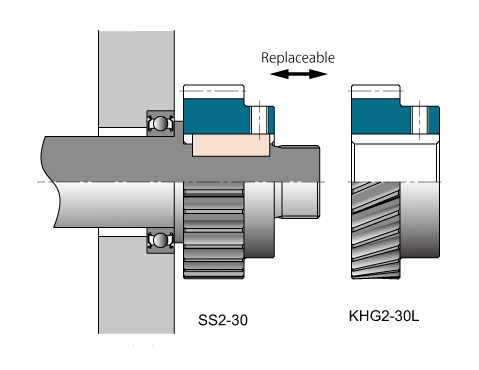 To increase strength, the SS2-30 Spur Gear is replaced with the KHG2-30R Helical Gear (mating with the left hand of KHG).